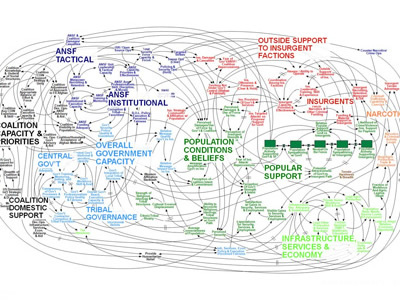 The Afghanistan Stability diagram is an intricate network chart that claims to comprehensively outline the situation of the war on Afghanistan. 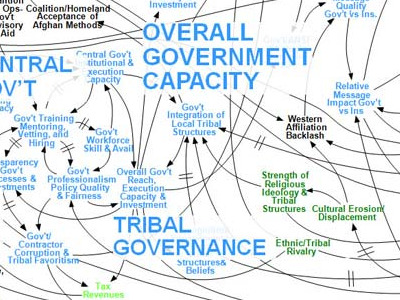 The nodes on the map are rouglhly divided into general clusters by color, and describe everything from domestic support for the operation, ro the dynamics of the insurgent factions, to popular support and various economic infrastrcutures at play. Famously, General McCrystal declared that "When we understand that slide, we'll have won the war" at a briefing in Kabul.